The Starter Kit: Server Room Monitoring allows to monitor temperature, humidity and illuminance. It can be used with nearly any programming language. If the kit is used together with the RED Brick, there is no programming necessary at all to receive emails if a measured value exceeds a predefined maximum or minimum value. The value range can be configured with the help of simple sliders. To date it was only possible to use locally installed sensors. 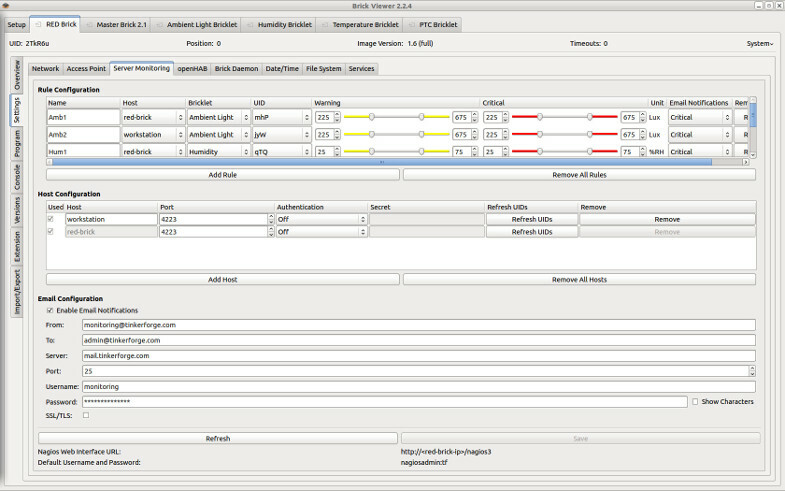 With the newly released version 2.2.4 of the Brick Viewer it is now also possible to evaluate sensors from other hosts! Every sensor that can be reached by a RED Brick through the local network can be administered. You can now use several Starter Kit: Server Room Monitoring and control them with one RED Brick. It is also possible to add additional sensors to PCs or with Ethernet- and WIFI Extensions. They just have to be in the same network as the RED Brick. One additional improvement of version 2.2.4 of the Brick Viewer is, that we removed all of the callbacks for Bricks and Bricklets from the Brick Viewer source code. The usage of callbacks in the Brick Viewer did lead to unexpected behaviors for users. If a user program did run in parallel to the Brick Viewer and the Brick Viewer deactivated a callback, the user program did not receive any data anymore. For many users this was often not easy to understand, they thought that there program or the Brick/Bricklet was faulty. With the new version these problems now belong to the past!